It is important to know how to setup your router for VoIP in order to have trouble free phone calls. Usually you will just power-up your VoIP device and immediately hear a dial tone and have the ability to make and receive calls. However, if you start missing calls, fail to make a call, or start experiencing choppy or one-way audio you may need to look under the hood of your router. In this article we will provide details of the router settings you should care about for successful phone calls with VoIP. I will start with a background on what a router is and why we need it, followed by some setup related details including information you need to gather from your VoIP provider. 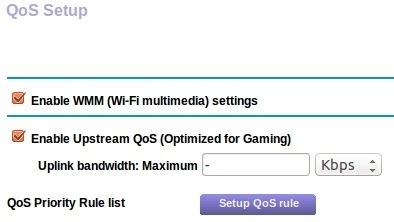 We will then go through the settings for router optimization, including SIP ALG, QoS, port forwarding, VLAN and DMS. Finally, I will touch on some other areas to consider if your phone service is still experiencing problems. A router is a digital device that routes data packets from one network to another, by intelligently examining the source and destination addresses associated with each packet. It also frequently acts as a firewall, ensuring that your Local Area Network (LAN) is not exposed to the outside world without your approval. One further benefit is Network Address Translation (NAT), which re-maps IP addresses from your private network (on the LAN side) to the Internet (WAN side) thus conserving the number of IP addresses that each home or business requires. In other words, LAN side networks can be common address ranges used by all of us and NAT maps this to a dedicated IP address specific to your connection to the Internet. It is important that we conserve WAN side IP addresses (for IPv4) as there is a shortage of them so NAT really helps in this respect. Routers used for VoIP typically cost less than $200 for home users and small businesses but can reach thousands of dollars for high end enterprise functionality. Before jumping into settings, we should first touch on the overall setup. There are a number of items to consider during the setup phase of your phone system. We will address each of these in turn. Before you even order a new VoIP service, run a VoIP test to get a feel for how good your Internet connection is. If your underlying Internet connection is poor, for example a satellite Internet connection, optimizing router settings will have little impact on improving your overall call quality. Assuming the tests pass and you order a VoIP service, it is important to touch on the subject of placement for each device in your home or business network. If you are at home you likely are using an Analog Telephone Adapter (ATA) which connects to your router using hard-wired Ethernet cables. Your analog phone then connects to the ATA using a standard phone cable. Businesses tend to use IP phones, again hard-wired using CAT5/6 Ethernet cable to your router, often via a switch. Very few devices use WiFi at this time of writing so for the purpose of this article, our focus will be on hard wired connections. If you have multiple routers in your network, and note that this does not include switches, avoid having your VoIP devices too far down the chain. In other words, do not connect them to a router which then connects to another one and then to your Internet modem. The reason is that each additional level of NAT is another potential failure point for your calls as each has to keep routing tables for where to send data packets. This is often referred to as "double NAT". One final note here, it is also worth checking that your router has the latest software image installed on it. Protocol for SIP (Session Initiation Protocol). Usually this will be either Transmission Control Protocol (TCP) or User Datagram Protocol (UDP). You need to know this when configuring certain settings. If the provider cannot give you this information either log in to your ATA and find out and if this is not an option, assume both for the purpose of configuring your settings. Ports used for SIP. This is for the control channel used for your phone calls. Usually this port will be in the 5060 to 5070 range but the SIP port numbers do vary by provider. Ports used for RTP (Real-time Transport Protocol). This is the actual audio packets sent during a phone conversation. They vary per provider but tend to be in the 10000 to 20000 range. RTP packets typically use UDP. It is unlikely your provider will give you this but if you can get the IP address of their PBX, it can be very useful. If you have your own PBX for your business, hosted in the cloud for example, make a note of the IP address. This can be "white listed" in your router and can prevent firewall related issues later. Now let's look at the settings that may need attention if you are experiencing trouble with your phone calls. I highlight some snapshots below from a consumer grade Netgear device (WNR1000) but the name and method of accessing these settings vary across manufacturers. The goal here is not to exhaustively show each setting across every model but instead to give you the generic name for the setting of interest. It is then up to the reader to find the corresponding setting for their router using the instruction manual for their device. In order to find out how to modify settings inside your device, consult its user manual. Usually this is simply a case of opening a browser window with a laptop that is connected to the LAN side of the router and typing in the first address (e.g. 192.168.1.1). This will then present you with a Graphical User Interface (GUI) for all the settings you can modify inside your device. Although this step is not required, I highly recommend reserving IP addresses for your phone devices on your Local Area Network (LAN). Otherwise you will find that when the DHCP lease time expires or a power cut occurs, your devices may be served with different IP addresses. This could cause problems for you in the future if you have your router settings optimized and based on the IP address for each VoIP device. Reserving IP addresses for your phones remove this concern. Figure 1 below highlights the screen on my router that is used for LAN IP reservation. It is under Advanced > Setup > LAN Setup : Address Reservation. You can see that my iPhone, which has a VoIP soft-phone client running, has a reserved IP address of 10.0.0.13, meaning it will always be served this IP address from my Netgear. SIP ALG (Application Layer Gateway) is an application that is found in most routers. It was actually designed to help VoIP calls during situations where NAT exists. The problem is that it tends to be more of a hindrance than a help. You can learn more about this feature in our SIP ALG article, but our recommendation is to disable this setting, as shown in Figure 2. In the case of my Netgear, this setting is under Advanced > Setup > WAN Setup : Disable SIP ALG. 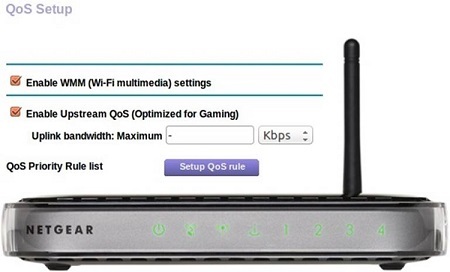 If your router supports QoS, it can be a great way to ensure consistent, high quality audio through your network. Essentially, the way this works is you can reserve bandwidth on the uplink side (i.e. to the Internet) to ensure there is always bandwidth available for your phone calls, regardless of other data being passed through your network. Figure 3 shows the setting in my Netgear device for reserving bandwidth. In my case I did not reserve an amount as I have a high bandwidth FiOS connection, but I could have done this here. It is also recommended that you run our VoIP test mentioned earlier to get an appreciation of how much bandwidth you have at your disposal. Assuming approximately 100Kb/s voice channels you can then determine how much bandwidth to reserve. As an example, if you have a maximum of 5 concurrent voice calls and 20Mb/s bandwidth then reserving 500Kb/s would be sufficient and would only be 2.5% of your overall bandwidth. The second part to QoS is the actual priority for each application. You can choose and edit from default applications installed on the device, or add your own QoS priority rules that are specific to your service. If you are armed with the provider settings that were discussed earlier, simply plug these in to your new rule and save (i.e. TCP/UDP, ports etc). Figures 4 and 5 show the settings for QoS rules in my Netgear, which are found under Advanced > Setup > QoS Setup. In Figure 5 you can see that I set the rule based on the MAC address of my phone. The MAC address is a unique identifier, which also removes the concern I stated earlier about setting rules based on IP address, which could change if not reserved. Port forwarding can be very useful if you are seeing NAT related issues during calls, such as one way audio or incoming calls not getting through. NAT can be a serious problem for VoIP as your router may block calls or audio from passing through to your phone and often it is tough to troubleshoot as it can be intermittent in nature (see NAT keep alive section later for further information on this). Assuming you know the provider specific details related to your phone service, you can forward all data for these ports to your phone. Just keep in mind that there is a potential security concern here as opportunists may scan these ports and could get through to your phone. This kind of problem can show itself in the form of ghost calls, where your phone rings but nobody is on the other end. In my Netgear, port forwarding is configured for SIP traffic by going to Advanced > Advanced Setup > Port Forwarding/Port Triggering : Add Custom Service. In Figure 6 you can see I have setup the standard SIP signaling channel on port 5060 to always be routed to the softphone running on my iPhone. In practice, this could be an IP phone, an ATA device or a softphone. You would also want to add another custom forward to cover the RTP media channel (e.g. port 20000 to 30000 or whatever your service provider tells you). Some higher end routers and switches have the ability to support Virtual LANs (VLAN). A VLAN allows you to sub-divide a physical connection into many virtual, or logical, connections. Each VLAN has a specific identifier tag. In terms of VoIP, a VLAN can be used as a form of QoS, allowing you to easily segregate voice from regular data on your LAN. You can then give the voice VLAN higher priority than your data. In my opinion, QoS priorities described earlier will work better in the majority of cases but for large call centers or enterprises, there may be an advantage to using VLANs. A De-Militarized Zone (DMZ) in a home or small office router is a way to expose all ports to the Internet for a device in your network, for example an IP phone. This is a very dangerous practice and puts your entire network at risk. I would only use DMZ as a last resort and even then, only for troubleshooting NAT relates issues. You would be better to configure port forwarding to accomplish this task instead of DMZ. If you do need to configure DMZ, and please consider yourself warned, you can do this easily on most devices. Figure 2 shows the DMZ setting for my Netgear. Simply check the DMZ box and enter the IP address of the device you are exposing to the Internet. If you have exhausted all of the options above and are still seeing problems, in this section I will outline a few other ideas to investigate further. These are not settings that exist in a router, they tend to be settings inside the IP phone, ATA device or the actual PBX. You may not be able to change these settings but may be worth further discussions with your provider. If you have your own PBX you can usually edit these fairly easily. NAT keep alive can fix many of the issues that you may come across with VoIP. As mentioned earlier, NAT can be a real problem as the router may not allow incoming calls through or corresponding RTP audio packets. It also may do this intermittently, where it works for a while but then the device stops allowing the traffic through after a certain time. This can happen if the phone does not ping the PBX server frequently enough. In other words, the phone needs to register with the PBX frequently and each time this opens a "pin-hole" through your firewall meaning that traffic from the PBX on the Internet side in to your router can also pass through. However, the firewall will typically only keep this connection open for so long. It therefore becomes a trade-off in terms of how frequent this communication needs to be and how much bandwidth is used, hence the idea of "Keep Alive" messages. A Keep Alive message is a message that is sent to the PBX server from your phone at specific time intervals, usually 20 to 30 seconds. This is a very short SIP message, so very little data is used, and its purpose is to keep the firewall pin-hole open. Often, this will fix certain NAT issues. As an example, take a look at settings for one of my IP phones, the Yealink T21P, in Figure 7 below. This will send a SIP Notify message as a Keep Alive, every 30 seconds. Rport is a mechanism that helps SIP packets reach its intended destination, when going through NAT. This setting typically needs to be set in the IP phone or ATA device, but also must be supported by the underlying PBX at the service provider. For my Yealink phone, you can see it being set in Figure 7. Ghost calls are phone calls that occur, often at inconvenient times such as during the night, and nobody is at the other end. The phone may ring for just a few seconds and it is very annoying. There are some settings inside ATAs and IP phones that can help if you are experiencing this annoyance, but changing them can cause problems if the PBX does not support them, so be aware of this. Validate Incoming SIP messages : Set this to True and it will prevent some spurious messages coming through. Check SIP User ID for Incoming Invite : Enabling this will ensure that only valid messages to your UserID will be allowed. In most cases your VoIP calls will work seamlessly and you will enjoy all those extra features, at a fraction of the cost of traditional landlines. However, there may be times when you run into issues and most of them can be fixed with some relatively straightforward setting optimizations to your home or business router. Hopefully this article gave you some insight into the correct router setup for VoIP to ensure trouble-free phone calls. Feel free to send us any comments or questions based on the contents of this article, we are happy to help.